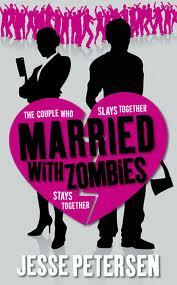 The entire premise of this book is impossible to resist, a sort of guide to marriage counseling through the eyes of the zombie apocalypse. Sarah and Dave are having marriage problems and have been attending marriage counseling. Both are somewhat ready to throw in the towel but when they arrive at counseling, they notice everyone is missing. Upon going into their counselor's office, they see her feasting on the couple that goes in before them. And, well, the zombies have arrived. The story then follows what Sarah and Dave do as zombies begin to take over their city of Seattle. And while they are forced together in this crisis, they begin to deal with some of their marriage issues. Each chapter starts with a little marriage tip for the zombie apocalypse such as my favorite, "Put the small stuff into perspective. It's better to be wrong and alive than right but eating brains." And the book is really funny. While I might get in a little bit of trouble for saying this, it reminds me of the best of chick lit...a strong snarky first person female voice that is instantly likable and a pleasure to read. Another one of my favorite funny bits, when Sarah has to tell her neighbor she killed her zombieified boyfriend "I shifted, throughly uncomfortable with what I'd done. Hallmark didn't exactly made a card for this situation (well they do now, but not then) so I wasn't sure what to say to her so that she'd understand I hadn't done this out of spite." Lest you think it's all fun and games, well it's not. It is a zombie apocalypse so there are some horrifying moments and LOTS of gore. Never enough tragedy to bring the tears I so dearly love to shed during most zombie books, but not all fun and games. A very fun way to spend the afternoon and best part? Flip This Zombie, book 2, is out in January.